Q: How did translating Wallenstein: A Dramatic Poem compare to your first translation with OBP, Fiesco’s Conspiracy at Genoa? A: Wallenstein is in every sense a much bigger piece than Fiesco: three plays instead of one; in verse and not in prose; a major tragedy and not a first attempt at a historical subject. Much more labor went into Wallenstein, both on my part and by OBP, which had grown meantime to meet the challenge of the larger project. Wallenstein is beautifully produced, in layout and in illustrations, and accompanied by an introductory essay worthy of so great a play, while Fiesco is more modest. In both instances my work with OBP was frictionless and gratifying. Q: What would you say is the central concern of Wallenstein: A Dramatic Poem? A: Wallenstein was written in a period of upheaval in Europe, the French Revolution, and set in another, the Thirty Years’ War. It treats of relations between the individual and the state and weighs moral questions of loyalty and betrayal. The upshot of it all is reflections on the process of history. It is a very big play. Q: What made you want to publish in Open Access? A: I chose OBP more than Open Access, and that because OBP is quick, smart, and responsive, and its books are handsome and intelligent. Open Access, of course, conduces to some of these qualities and adds yet another: wide dissemination of desirable and useful material to the academic community and to other cultivated readers. 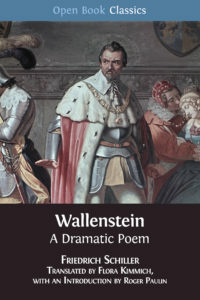 You can read Wallenstein: A Dramatic Poem for free here.